Yesterday’s lineup finished with 105.6 which was good enough to win in the 50/50 contest. The other lineup finished with 114.60 but was just shy of making money on the $15k Solo Shot contest. This entry was posted in About Us, Baseball, Baseball, Home, Midwest, National, Uncategorized and tagged DraftKings, Miguel Cabrera, MLB. Yesterday’s lineup finished with 109 points which was not good enough to win money. Having the game in Pittsburg hurt my chances with McCutchen still in the lineup. This entry was posted in About Us, Baseball, Baseball, Midwest, National, Uncategorized and tagged DraftKings, Miguel Cabrera, MLB, Zack Greinke. June 5th lineup did not reach the 85% mark like the previous 4 days but it did reach 72.5% (1295/4705). This results in another win if placed on a Double-up contest. This brings me to the point of strategy when picking contests not lineups. I suggest always putting a lineup in a featured contest because these contests have the most reward while you only risk $3,$5,$9. Furthermore, I expect to reach over 53% on every lineup so covering the amount you bet on a featured contest with a 50/50 (double-up) contest can cover any loses in case the lineup does not reach to top 85%. This lineup is subject to change once the starting lineups have been entered by the MLB teams. Changes will be made before 5. Lester looks to take home his 7th win against the Phillies. This lineup is also subject to change when the MLB lineups are posted. Changes will be made before 5. This entry was posted in About Us, Baseball, Baseball, Home, Midwest, National, Uncategorized and tagged DraftKings, John Lester, Miguel Cabrera, MLB. Before the Detroit Tigers stole Prince Fielder from free agency, they were in the same boat as the Royals, Twins, and Indians. All teams in the central division had their eyes realistically set on making the playoffs. With the returning MVP and Cy Young winner in Justin Verlander, the Tigers and Coach Jim Leyland have the edge over every team in the division. Fielder has extremely “heavy” stats with 36 home runs with 120 runs batted in. He can flat out rake. The addition of Prince Fielder adds major protection to third baseman Miguel Cabrera. Along with protection, Prince Fielder sells jerseys and tickets. Oh yeah did I mention he can hit. 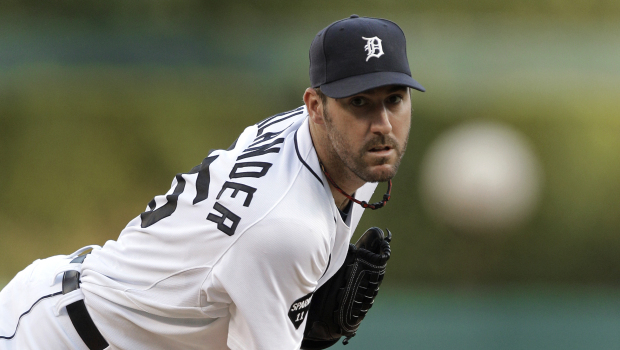 Justin Verlander basically puts the starting rotation on his back. He is the overwhelming ace of the ball club. Verlander won 24 games but what is more important to the rest of the pitching staff is how many innings he was able to eat up 251. In those 24 wins he was able to complete what he started 4 times. To go along with Verlander the Tigers have the young prospect Jacob Turner. Turner will never be on the same level of Verlander but will serve as the Tigers 2 or 3 starter for many years to come. As the second pitcher on the staff Doug Fister won 11 games with an ERA under 3.0. Fister has extremely high expectations for the 2012 season. I predict him to win 17 games and play an essential role in the Tigers success. The third pitcher will be former Missouri pitcher Max Scherzer. Scherzer’s major flaw is being about to pitch a consistent season. When hot, Scherzer is nearly untouchable but when he is bad he is brutal. Scherzer should be happy to record 15 wins this season. The 23 year old Rick Porcello is a crafty ground ball pitcher. I expect Porcello to win around 14 games. He can be expected to win 20 games before he turns 26 years old. The line up that Jim Leyland gets to put out everyday will be headlined by Prince Fielder and Miguel Cabrera. Cabrera is a 6 time All-Star and has played first base, outfield, and now third base. While Cabrera is a liability in the field, he does more then make it up with his bat. Last year he hit .344 with 30 home runs and 105 runs batted in. An underrated aspect to Cabrera’s game is his ability to play everyday. Last year he played in a total of 161 games. The Tigers hit a major home run with the signing of Cicil’s son Prince Fielder. Expect to see Delmon Young drive in at least 100 runs this year because of the protection he will be giving to Fielder and Cabrera. The Tigers easily have the best lineup in the central division. Alex Avila is an exceptional hitting catcher along with a defense to make him a complete catcher. The do it all Brandon Inge will find his home at second base this year. Inge has experience at nearly every position including catcher, third base, first base and now second. Expect the Tigers to be close to leading the Majors in errors. They have no outstanding fielders and many slow moving pieces in Fielder and Cabrera. The Tigers will win the central division and can make a push in the playoffs because of their three superstars. Jim Leyland will enjoy smoking his pack of cigarets a game more this year then in years past because of the excitement his lineup can create on any given night. The Tigers will finish with a record right around 92-70. Verlander will be in the top three in Cy Young again and Prince Fielder and Cabrera will be the toughest one two punch in the AL. My bold statement is that Delmon Young will be an All-Star or have over 90 RBI’s. Another bold statement is that a pitcher along with Verlander will have at least 18 wins. This entry was posted in Baseball, Baseball, Home, Midwest, National and tagged Detroit Tigers, Jim Leyland, Justin Verlander, Miguel Cabrera, Prince Fielder.